Has anyone seen the Seattle tourist office? Well, news flash. There is no Seattle tourist office. At least not in the traditional sense of the word. But hey, that shouldn't matter because you were lucky enough to find this site, right? What do you need at a tourist office that you can't find here (or at least somewhere online)? That's the great thing about the internet these days: there is a ton of information available on every type of subject you could ask for. However, you are here to presumably learn more about visiting Seattle on your next vacation. Good choice, by the way. OK, so back to Seattle. First of all, you don't really need a Seattle tourist office. Why not? Well, think about it. I don't know about you, but for me, whenever I go and visit someplace new, I would rather forgo all the hokey touristy things and see what the locals love about the place they live. You'd never get that kind of information from a touristy office set up to get vacationers to spend money on worthless activities. So if there's not tourist office, what is there to help you once you get to the city? Well, first of all, hopefully you have access to the Internet. Why? So that you can access this site of course. BUT... if you feel like you need to talk to someone once you get to Seattle, there are a couple of places you can go to get some information on the local scene. 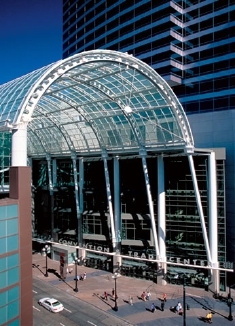 Located at the Washington State Convention and Trade Center on Pike Street. This is probably the best "Seattle Tourist office" in the Pugent Sound. So there you have it. If you're feeling the absolute need to get your hands on some brochures, I'm sure the above places can help you. I've personally never stepped foot in any of these tourist offices (why should I when I've got this site and the Internet), but hey, if you feel like you need to spend one of your days in Seattle picking up pamphlets instead of getting some grub at Spuds at Alki beach or kayaking on Lake Washington, be my guest. Back from the Seattle tourist office.